Beat egg yolks and sugar until light and lemon-colored. 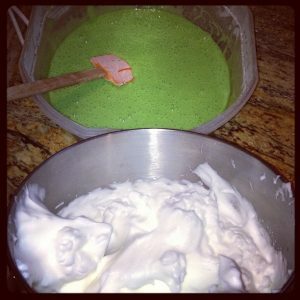 Add in the oil, coconut cream, pandan juice, pandan essence, vanilla essence and salt. Sift flour and baking powder over the mixture. Mix well until smooth. Add in 1/3 of the beaten egg whites into the egg yolk mixture and mix gently with whisk, to ‘lighten’ the mixture. Using a spatula, fold in the rest of the beaten egg whites into egg yolk mixture, gently, to prevent batter from deflating. Do not overfold. Pour batter into nonstick TUBE pan. Run a spatula through the batter to eliminate large bubbles in the batter. **do NOT SPRAY THE BAKING PAN!! Bake at 350 degree in preheated oven, for about 60 minutes or until a skewer inserted in the cake comes out clean (or with few dry crumbs adhering) make sure the top is GOLDEN in color. Take the cake out and invert the cake upside down on something. 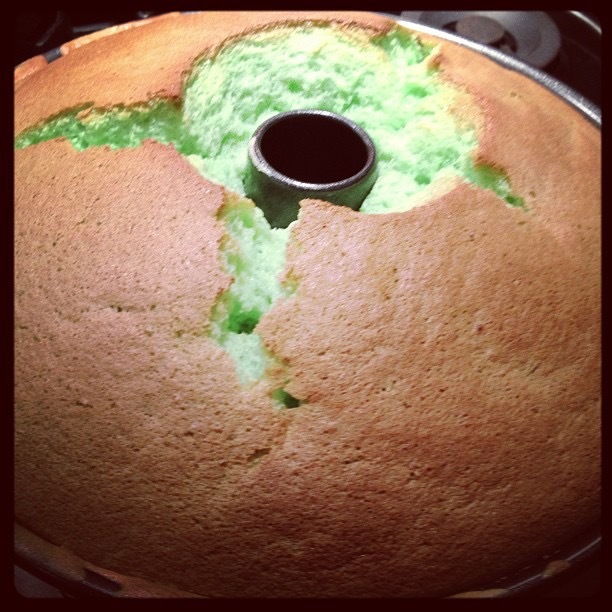 I used 4 cans of food…let the cake cool in this position. 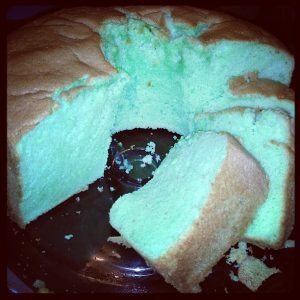 Once cake is cool…run a knife along the tube pan…then invert onto a serving plate. When slicing the cake…I find using a bread knife works best.